YOU and I are His disciples! John 15:16 16 You did not choose me, but I chose you and appointed you so that you might go and bear fruit—fruit that will last—and so that whatever you ask in my name the Father will give you. There is so much going on in our world right now that could cause us to be distracted from the calling on our lives. We have sports, entertainment, family responsibilities and gatherings, jobs, electronics etc.. It is easy to become waylaid from the purposes God has called us to accomplish. Each day it is a choice as to whether we will fulfill His purposes for our lives or we will fulfill our own goals and purposes. Do we spend more time in front of the tv than in the Word of God? Do we waste time gossiping instead of interceding for others? Do we choose to stay home and relax instead of getting ourselves to church on Sunday? We are daily faced with these type of decisions and sadly many Christians are choosing the way of their own comfort. We have been given the gift of salvation through a Savior that lovingly died for us yet often we can’t even bring ourselves to spend any time with Him in prayer or in the Word of God. Too often, we would entertain ourselves with things that have little to no lasting spiritual significance. 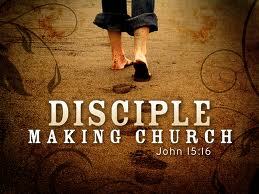 When we made the decision to follow Christ, we became His disciples. As disciples we have a purpose that involves more than our own comfort. The online Merriam-Webster dictionary gives the following definition of a disciple..
John 8:31 NIV 31 To the Jews who had believed him, Jesus said, “If you hold to my teaching, you are really my disciples. John 15:8 NIV 8 This is to my Father’s glory, that you bear much fruit, showing yourselves to be my disciples. John 15:16 NIV 16 You did not choose me, but I chose you and appointed you so that you might go and bear fruit—fruit that will last—and so that whatever you ask in my name the Father will give you. Hebrews 10:25 NIV 23 Let us hold unswervingly to the hope we profess, for he who promised is faithful. 24 And let us consider how we may spur one another on toward love and good deeds, 25 not giving up meeting together, as some are in the habit of doing, but encouraging one another—and all the more as you see the Day approaching. If we are to be true followers of Christ we cannot be Christians in name alone. We must daily make the decision to obey Him and His leading in our lives. We are to share the good news with those who desperately need to hear it! We need to encourage our brothers and sisters who may be struggling and we need to continue to move forward in the power of the Holy Spirit. Every single one of us has been called with a purpose and we all need to be doing our part in the body until Jesus returns or He calls us home. If you have become a Sunday seat warmer only, ask God to forgive you of your spiritual idleness and stir up in you a desire to fulfill the purposes He has called you to do. Don’t waste another day! Lord, I ask that you would forgive me for my spiritual laziness that has allowed me to put my comfort before Your purposes for my life. Please stir up in me the giftings that You have given me and show me what I can do this day to further Your kingdom. Give me a heart that loves what You love and hates what You hate and empower me to demonstrate that love to those who need it. In the precious name of Jesus, Amen.